Enjoy the Holidays the NYC way…with a Cannoli! | tinbox marketing solutions, Inc. Enjoy the Holidays the NYC way…with a Cannoli! NYC’s Ferrara Cafe is world-renown for their fantastic Italian pastries. From their tins of delicious cookies to their out-of-this world cannolis, Ferrara is one of those places that may be considered a tourist trap, but one that is totally worth the trip. Family run for over 115 years, each dessert offered reflects the years of training and experience that have been passed down from generation to generation. We, fortunately, get to enjoy the sweet rewards. TINbox Solutions is proud to have been tasked with designing their 2010/2011 catalogs, as well as their print marketing campaigns. TINbox has also expanded it’s role with Ferrara, handling some of their print and mailing distribution initiatives.TINbox Solutions loves designing for the restaurant community. Please feel free to visit us at www.tinboxsolutions.com, to see our portfolio! And, the next time you are in NYC, make sure to pick up your own copy of the 2010 Holiday Catalog. It’s available now at Ferrara, and through their mailing list at www.ferraracafe.com. 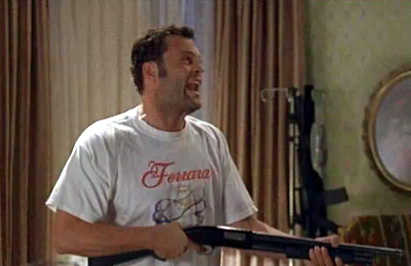 If Vince Vaughn-with-a-shotgun says Ferrara's is good, you know you've got to listen.